All Wells Fargo Routing Numbers (ABA Numbers) for California, Texas, New York, New Jersey, Ohio, Michigan, Georgia, Florida, Illinois and all other US States. An ABA Routing Transfer Number is an ID number that will identify a bank as a federal or state institution. The number proves that that the bank is able to maintain a Federal Reserve account. A Routing Number enables Federal Reserve Banks to process Fedwire funds transfers, and to process bill payments, deposits, and other transfers via the Automated Clearing House. Routing numbers are necessary when bank customers are paying bills by phone by using a check, when reordering checks or when a bank account holder sets up a direct deposit. A routing number identifies the bank used by an account holder. A routing number is not the account number. To find a Wells Fargo routing number, you can browse the check issued by your bank. 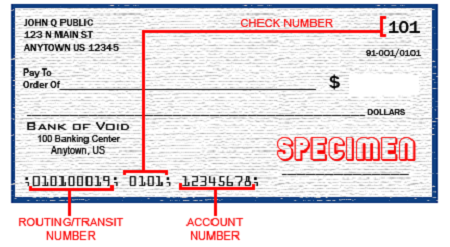 Example of a check. The routing numberis located in the bottom left corner. The Wells Fargo routing numbers will be different depending on the location where the original Wells Fargo bank account was opened. Below, we have listed the full list of Wells Fargo routing numbers. Wells Fargo routing numbers differ for Wells Fargo Checking and Savings accounts, Credit Cards, Lines of Credit, and wire transfers. Wells Fargo International Wire Transfers. International wire transfer is a popular way to receive money from foreign countries. All Banks use the SWIFT network for performing international wire transfers. American banks do not use IBAN account numbers. Wells Fargo Incoming International Wire Transfer Instructions. Use these details to receive an international wire transfer in your Wells Fargo account. Domestic Wire Transfer to Wells Fargo. Domestic wire transfers are performed by the Fedwire system or the Clearing House Interbank Payments System (CHIPS). Wire transfers are different from ACH transfers, as Wire transfers are real time transfer, whereas an ACH transfer takes 2-4 days. Incoming Domestic Wire Transfer Instructions for Wells Fargo. You can receive funds to your Wells Fargo account from any bank within USA by using a domestic wire transfer. Wells Fargo Wire Transfer Fees. International wire transfers also involve currency conversion. Banks often make an extra 1-2% on the currency conversion. Use Transferwire.com or CurrencyFair.com as an alternative. Wire Transfer Cut-off Time for Wells Fargo. The Wells Fargo Wire Transfer daily Cutoff Time for Outgoing international wire transfers from a consumer account is 3 p.m. CT (Central Time). The Wells Fargo Wire Transfer daily Cutoff Time for Outgoing domestic and wire transfers and outgoing drawdowns is 4:30 p.m. CT (Central Time). The Wells Fargo Wire Transfer daily Cutoff Time for Incoming wires is 5:30 p.m. CT (Central Time). Routing numbers are also known as “Check Routing Numbers”, “ABA Numbers”, or “Routing Transit Numbers” (RTN). The ABA routing number is a 9-digit identification number assigned to financial institutions by The American Bankers Association (ABA). The number determines the financial institution upon which a payment is drawn. Each routing number is unique to a particular bank, large banks may have more than one routing number for different states. Routing numbers may differ depending on where your account was opened and the type of transaction made. IBAN stands for ‘International Bank Account Number’, which is used in Europe, when making or receiving international payments. An IBAN doesn’t replace the sort code & account number of European bank accounts. It is an additional number with extra information that helps overseas banks identify an account for payments. The SWIFT Code is a standard format for Business Identifier Codes (BIC) that is used to uniquely identify banks and financial institutions globally. These codes are used when transferring money between banks, especially for international wire transfers or SEPA payments. The Swift code consists of 8 or 11 characters. When 8-digits code is given, it refers to the primary office. When transferring money in Europe, you will often be asked for a SWIFT/Bic number. The Fedwire Wire Transfer service is the fastest way to transfer funds between business accounts and bank accounts in the USA. It is used for domestic or international transactions in the US, where the account balance is directly debited electronically and the funds are transferred to an account in real time. To complete a wire transfer, the sender must provide his bank name and account number of the recipient, the receiving account number, the city and state of the receiving bank and the bank’s routing number. Please share your experiences, questions or complaints about Wells Fargo & Company, in the comment section. Thank you for the routing number info. Was getting a bit confusing with all those regional numbers.